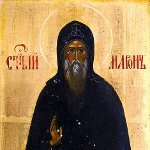 Saint Maroun (also Maro or Maron) was a priest and hermit. His life and miracles attracted many followers. After his death in 410 AD a special movement was founded, that became known as the Maronite movement. The Maronite movement reached Lebanon when the first disciple of St. Maroun, Abraham of Cyrrhus, realized, how many non-Christians were in Lebanon. He decided to convert them to Christianity and introduced them to St. Maroun. The Maronite Church has achieved a profound influence in Lebanon, while in modern Syria, Jordan and Israel it is one to a lesser degree. Today about the half of all Maronites lives in Lebanon, where St. Maroun's Day is a national holiday. The Maronite Church is the largest in Lebanon: about 37% of Christians and 17% of the population belong to the Maronites. The Maronite communities also exist in Australia, Argentina, Brazil, Egypt, Israel, Palestine, Jordan, Canada, Syria, the United States, France and Cyprus.